Blackberry , welcome to the forum. What a nice visitor you catch on the nest. After a long and snowy winter with lots of agility trainings and competitions (in of doors, of course), I'm back at the forum. There is somebody very beautiful sitting in the kalakotkas2 nest. Unfortunately I haven't yet studied how to attach a screen capture image to the forum. What a nice guy was "testing the nest-bowl" today . Ilmar isn't Piret's mate, this is Madis. Yes-Yes, wonderful news! Glad to see the girl-osprey in his nest! And sweet to hear her sweet voice, the clicker her beloved!!! Eden wrote: Ilmar isn't Piret's mate, this is Madis. Where is Piret's nest and who is her husband??? 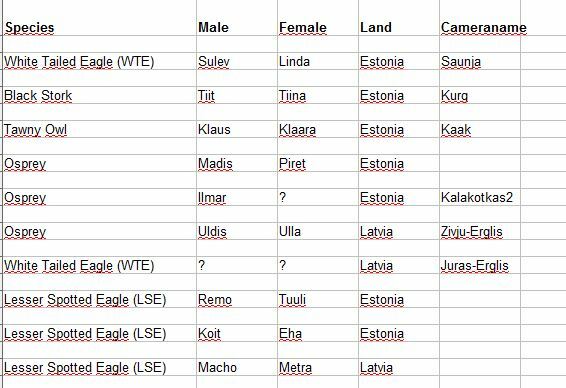 Pirets and Madis nest is in Estonia, but the camera for the nest is not yet online. The Ospreys we can already watch now are on a nest in Latvia, the inhabitans are Ulla and Uldis. Thanks Bea, but no, I don't get it! Is there any list of ALL cameras with the name of the inhabitants of the nests? And the 2 ospreys, we can watch now on the nest in Latvia, are definitively Ulla and Uldis? They have no rings? Janne+Ais wrote: Thanks Bea, but no, I don't get it! Eden wrote: Bea:The Ospreys we can already watch now are on a nest in Latvia, the inhabitans are Ulla and Uldis. Eden:And the 2 ospreys, we can watch now on the nest in Latvia, are definitively Ulla and Uldis? They have no rings? I´m not so familiar with the nest, I can`t answer definately. Reading the last years forum and pics are a possibility to find out. O this helps me a lot! You are an angel! Thank you so much! And now my question again: What will Madis (not Ilmar) do, if Piret remains in Africa or over the rainbow bridge? I have no idea .... last year was the first season with an Osprey Cam, before that I didn´t know anything about these birds. Perhaps one of Kotkaklubi Eaglemen will answer. My guess is that Madis will wait and expect Piret for a while, but if she doesn´t come home he will accept another female. So it is, like Bea quessed! But of course everybody wants to see Piret there breeding, even with not functioning transmitter would be better as not to meet her.